The Extension Tubing with Connector is latex-free with a plastic connector on one end. Constructed of a heavy gauge vinyl, it provides security from leaking. 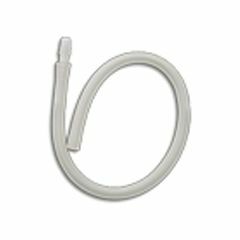 Used for connecting male external catheters to leg bags. Stepped Connector: Facilitates the ease of connection and removal of tubing without compromising security. The leg bag utilizes a stepped plastic connector. Can't find latex extension tubes anymore and other plastic tubes don't hold the fittings even with tape. The Hollister non latex material is very flexible and holds fittings as good as latex or even better. I had used these in the past, but several recently have easily come disconnected from my leg bag, or the top nozzle itself has pulled free from the tubing. I now glue the tubing to the leg bag itself. Easy Storage. Sturdy. Safe. Lightweight. does not kink. use to connect my leg bag. Usually no problems but can fold over connector and cause a blow off of my external catheter. I use an extra strap with it to prevent this. We use to connect to a urinary leg collection bag. This tube has a slighty flattened shape which lays perfectly on the leg. The connector is secure. Very soft and definitely pliable! I feel they are a little long for my husband, and I am able to cut them with bandage scissors! what's the inside and outside diameter of the tube? How flexible is it?